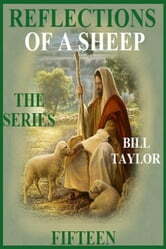 “Reflections Of A Sheep - The Series” is a sixteen installment “Mini Book” format touching on the many and varied scenarios we as humans encounter on a daily basis, as we sojourn with God on Planet Earth. Hopefully insightful. Hopefully helpful. Hopefully a blessing to all. Bill Taylor.